For our third annual White House Holidays ornament, we are highlighting a room in the White House. 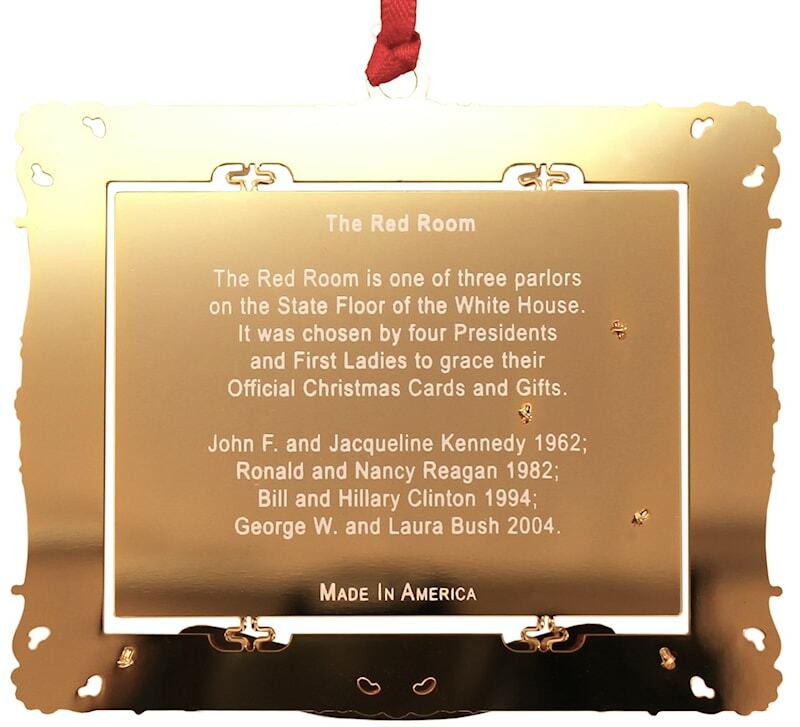 The Red Room graced the Official Christmas cards and gifts of four presidents- Kennedy, Reagan, Clinton and GW Bush. 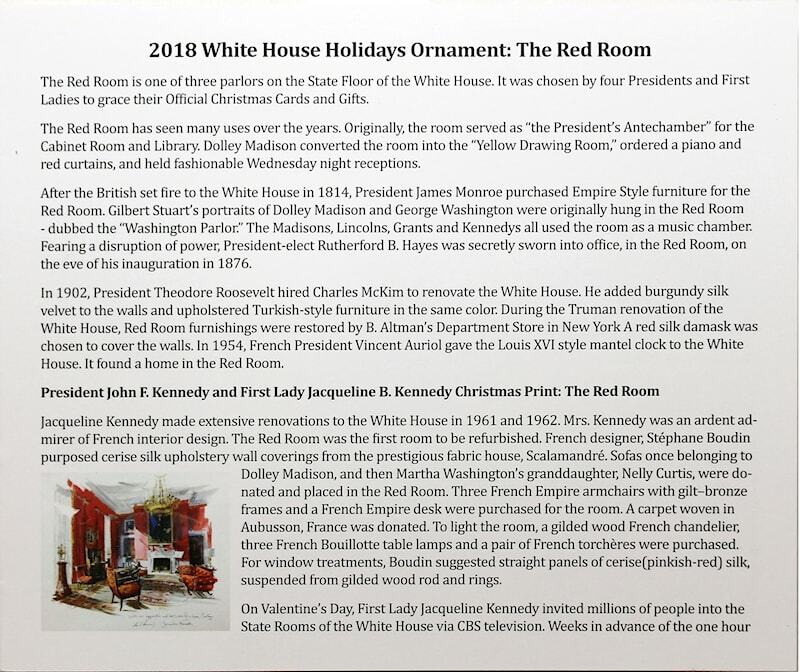 While this is not the Official White House Historical ornament, the full story is revealed in the book, "Season's Greeting from the White House"now in it's 8th edition. A synopsis of those stories follows below. Keep reading. 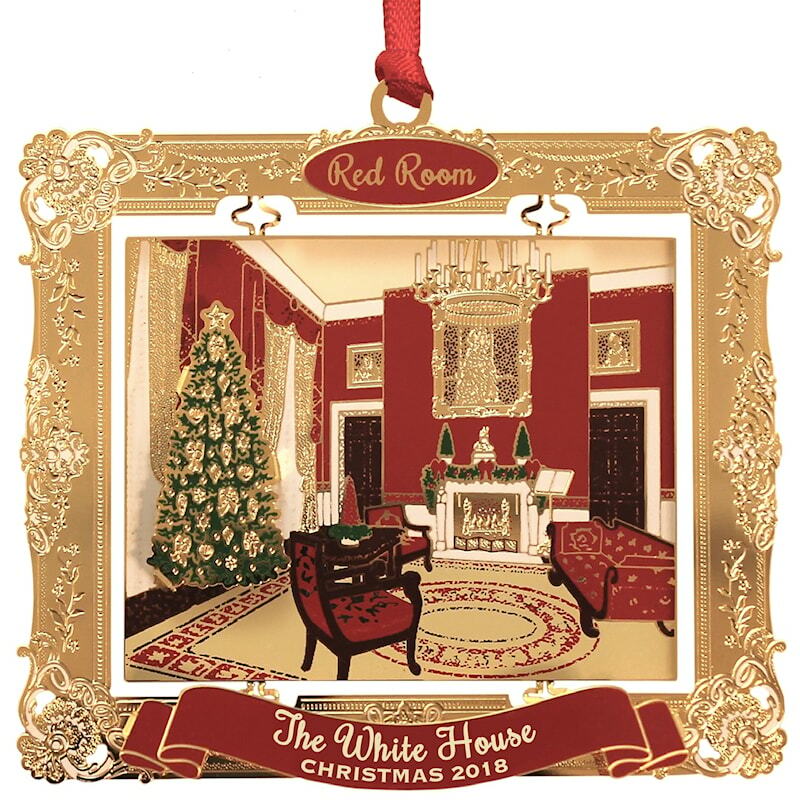 The 2018 White House Holidays Ornament is an original composition of The Red Room, which is one of three parlors on the State Floor in the White House and was chosen by four Presidents and First Ladies to grace their Official Christmas Cards and Gifts. Edward Lehman painted the Red Room for John and Jacqueline Kennedy's gift print in 1962, after Mrs. Kennedy showed the nation via CBS television her renovation of the room. Nancy Reagan had fond memories in the Red Room and commissioned James Steinmeyer to paint it. He meticulously documented the room and added a touch of the holidays. His warm rendering became the art for the Reagan's Christmas card and gift print in 1982. Hillary Clinton wanted to highlight the house at Christmas. She favored contemporary artist Thomas Mcknight, who removed 19th century paintings from the walls and replaced them with personal images. He added a Christmas tree, hung stockings on the mantel, placed a new saxophone under the tree for the president and a tea set for the first lady, and caught the cat napping under the chair. Mrs.Clinton loved his fanciful rendering lit by a dreamy moon. The art was reproduced on the Clinton's card and gift print in 1994. After months of searching for an artist to design their holiday card, Laura Bush chose fellow Texan, Cindi Holt, to modify her impression of the Red Room that Cindi painted as a volunteer who helped decorate the White House at Christmas. She lit up the room with various elements and The Bushes added a scripture verse to their holiday greeting. Read all about this collectible ornament with the history card that accompanies the ornament in its beautiful red box. What can be better than a Red Room for Christmas, and here's the perfect ornament to capture this White House history. This ornament is even more beautiful in your hands and on your tree than it is in the pictures. We've crafted this ornament with details that literally pop out. The tree is physically mounted above the rest of the ornament, so it casts real shadows in the Red Room. And our beautiful red banner at the bottom of the ornament is surfaced above the border, which in turn is surfaced above the Red Room itself. See, it's pretty hard to describe, but when you receive this incredible ornament, you'll understand even more fully how much care and attention was paid to its design. Size: 3 1/4" x 2 3/4 x 1/4"
This ornament is a continuation of a series of White House Holidays annual ornaments that complement "Season's Greetings from the White House," now in its eighth edition, documenting almost a century of Christmases at the White House - from Calvin Coolidge to Donald J. Trump. This 8th edition of the book will launch in September-in plenty of time for Christmas gifts. Save on our two most popular collectibles! 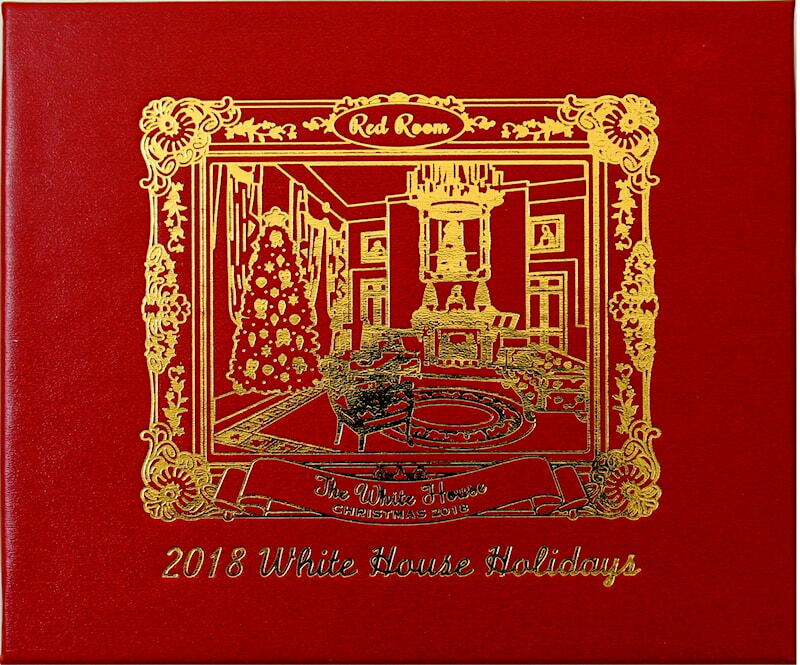 Our 2018 White House Holidays Ornament and Seasons Greetings From the White House book are our most popular collectibles. Buy both and save. These are great for your own collection and also make great gifts. You must click the 'Add Offer To Cart' button next to the promotion desired to receive the special pricing. You will not receive the special pricing if you add the items to your cart individually.